On November 11, Turkish authorities detained Olivier Bertrand, a journalist for the Paris-based Les Jours news portal, who was working in the Turkish southern city of Gaziantep near the Turkish-Syrian border. After three days in detention, he was able to return to Paris. In an interview with Sputnik France, the journalist commented on his arrest. Bertrand noted that he took all necessary precautions while working in Turkey, but still was arrested by the local authorities under pretext of not having a special work permit. "I think that this story with a permit is only a pretext. Although since April 2015, indeed, [journalists] theoretically need a work permit in some Turkish cities, including Gaziantep, all media do without it. Usually, journalists are free to come to Gaziantep. It is located far from the Syrian border, about 75 kilometers away from it, and almost all work in Gaziantep without permission, which I did myself six months earlier," the journalist told Sputnik France. The arrest of the French journalist — who visited Gaziantep to make a report about a local school once again shows that freedom of the press in Turkey is in danger. More than 140 Turkish journalists are currently in prison. Many of them, including the employees of Turkish opposition Cumhuriyet newspaper, were arrested because Turkish authorities suspected them of having links with supporters of the Islamic preacher Fethullah Gulen, whom Ankara believes to be behind the July coup attempt. "I have never written articles to protect Gulen. I am doing my job as a journalist, a carefully-worded, unbiased and honest job. This summer, after the putsch and after the Turkish government had accused supporters of Gulen of organizing the coup, my job as a journalist was, first of all, to try to explain who Fethullah Gulen actually is, because nobody knows about him here [in France]," Bertrand said. Turkey has repeatedly drawn criticism for the crackdown on opposition parties, media and academics. Its discriminative policy towards journalists has been criticized by Brussels and various rights groups. According to the reporter, the Turkish government has difficulties to understand that "a journalist is supposed talk to all parties when he wants to do his job impartially." "Today in Turkey, you are viewed as an accomplice when you discuss or cite someone who is an associate or close to the associates of Gülen, or someone close to a Kurdish organization," the journalist said. In Bertrand's opinion, "there are practically no more viable opposition newspapers" in Turkey. All media are "under the governmental control," the journalist explained. However, he still believes that journalists can do a lot to promote the media freedom in the country. "There is still one important thing, the Internet. The regime often cuts off the Internet and access to social networks, but I think that today websites are the only possible and easiest way to create a flexible information product without significant investments," the journalist concluded. On July 15, an attempted coup took place in Turkey and was suppressed the following day. 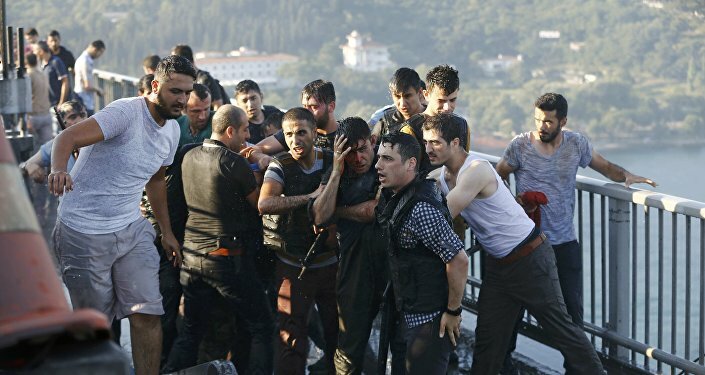 Over 240 people were killed during the coup attempt and an estimated 2,000 were wounded. Ankara has accused Gulen and his movement, outlawed in Turkey, of playing a key role in the coup. Gulen has denied the accusations.